We have a poor orphaned blogger that wasn’t included in the Secret Recipe Club for this month. It is Connors Cooking. Now I am not sure if you know this, but last month I got her for Secret Recipe Club and made her delicious Banana Split Parfait. Connors Cooking was not included, a few bloggers went ahead and with Amanda’s blessing did a quick post on her. I decided to do her Souped up Meatloaf. I know some of y’all are not meatloaf eaters, but this was flavorful and not at all dry. In fact, she did it in the crock pot, so you don’t have to heat up your house to enjoy it. With the hot days of summer I am sure we all could appreciate keeping our house cool, by using the crock pot instead of our oven. Not to mention the convenience of letting the crock pot do its thing. 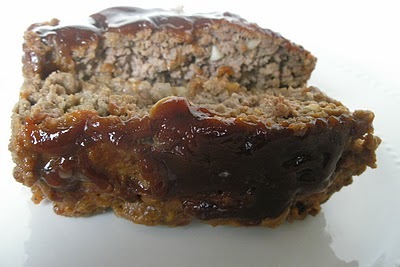 So if you get a chance visit her cute little blog, and if you get a chance make her delicious meatloaf. Never thought to do meatloaf in a crockpot. It was fun coming together and cooking from Connor’s Cooking. I hope that you’ll check out the Nutella Crêpes which I made from her blog. Meatloaf is my son’s favorite meal. I’ve never tried it in a crock pot but that would be great to keep it cool inside. Looks great..I am not sure what the Secret Recipe Club is…but it sounds like a fun group of women! SO FUN THAT WE ALL JOINED TOGETHER FOR SRC CLUB TODAY!!! THIS LOOKS LKE A MUST TRY! We love meatloaf and the best thing about it is the day after when you can have it in a sandwich! Thanks for taking the time to make a recipe from my blog! I love crock pot recipes – glad you enjoyed it! How nice of you all to take the time to help the orphan. This recipe looks awesome!